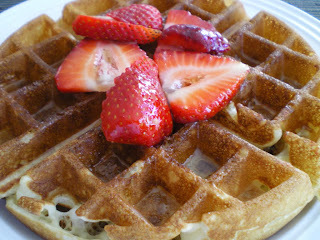 This is my very favorite waffle recipe EVER. You have to start the batter the night before but they are SO worth it. Mmmm, waffles… (sorry). 1. Warm milk and add cut-up butter to melt. 3. Add yeast mixture to milk, butter, salt, sugar and flour; beat with mixer until smooth. Cover with plastic and refrigerate over night. 4. Just before cooking waffles, beat in eggs and baking soda. Stir until well mixed. 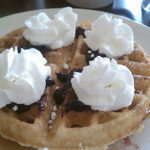 Set waffle iron to 5 or 6. 5. Pour ample 1/3 cup batter into each section. 6. Cook until waffles are golden and crisp. 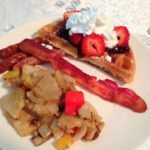 One Response to "Raised Belgian Waffles–A recipe!"